We have operated a bookshop on the Manor House Finchley site for over 25 years. A wide range of Jewish titles are stocked, including Liberal, Reform, Conservative and Orthodox publications, as well as secular and academic titles. The shop is unique in that it stocks a much wider ranger of titles than any other Jewish bookshop in the UK. Most of our stock is imported from the USA and includes a large selection of children’s and educational books. 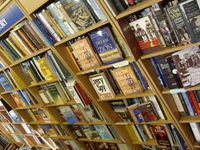 We always have several hundred bargain books at half published prices or less. Also stocked is a full range of ritual Judaica, including tallisim, kippot, menorahs, mezuzahs, crafts and gifts from Israel, US and the UK. We mail-order, mostly next day, in the UK and export anywhere in the world. There is a Cafe on site during the week. Orders usually ship within 2 business days. Shipping costs are based on books weighing 2.2 LB, or 1 KG. If your book order is heavy or oversized, we may contact you to let you know extra shipping is required. We will also adjust shipping for multiple title orders.